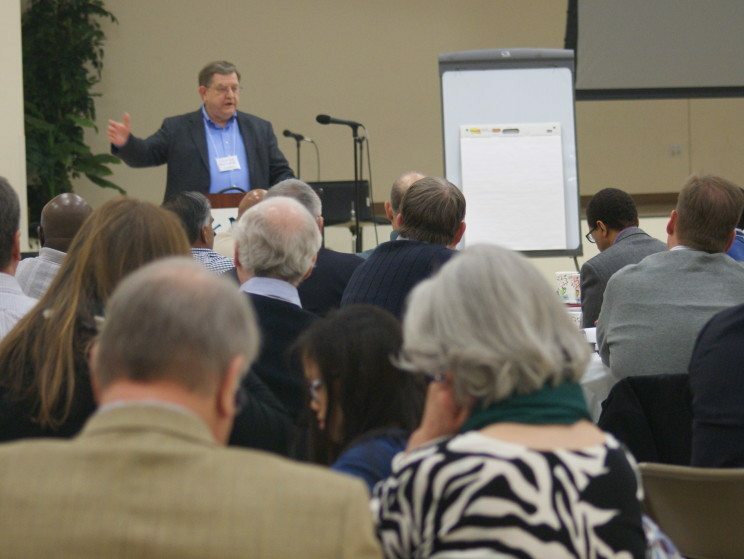 Last week in Philadelphia, about 90 Baptists from across North America gathered to celebrate past Baptist collaboration and to dialogue about the future. Called “FutureBaptists,” the two-day event at Enon Tabernacle Baptist Church was held to celebrate the fiftieth anniversary of the North American Baptist Fellowship (NABF). The NABF, founded in 1964, is a regional fellowship of the Baptist World Alliance (BWA), a group that unites more than 200 Baptist bodies in more than 120 countries. Churchnet is a member body of both the BWA and the NABF, and leaders of both organizations have spoken at Churchnet annual gatherings. Churchnet’s Executive Director, Jim Hill, currently serves as NABF president. Hill attended the FutureBaptists gathering and offered brief remarks to welcome those present. Others from Churchnet who participated included President Donna Potts, Vice President Forrestal Lawton, Editorial Assistant Brian Kaylor, Leadership Development Team Leader Jeanie McGowan, Missions Mobilization Team Leader Gary Snowden, Church Planting Team Leader Owen Taylor, and others. Potts, who serves on the NABF Executive Committee, expressed how she enjoyed the meeting, especially since it was a larger gathering than the usual NABF meetings. This year marks the 50th anniversary of the creation of the NABF and the 200th anniversary of the creation of the Triennial Convention (the group now known as American Baptist Churches, USA and from whom the Southern Baptist Convention split off at its formation). The Triennial Convention was formed in Philadelphia to bring Baptist churches together to support missionary endeavors. Its creation transformed Baptists in the U.S. as they came together for their first unified missions effort. Several international Baptist leaders joined the NABF gathering, helping make one focus of the event the need for North American Baptists to connect better with the global Baptist family. BWA President John Upton, who also serves as Executive Director of the Baptist General Association of Virginia, noted during his remarks at the gathering that collaborating with other Baptists transforms us. Thus, he urged Baptists to embark on a journey together and follow God in faith even if we do not know the final destination. “I don’t have to know where I’m going, just who walks beside me,” Upton explained. “A future marked by openness to affirm others as part of the one family of God is a future worth working toward,” Callam added. Lawton, who leads the Men’s Department for the BWA and briefly talked about that effort at the event, pointed to the dialogue process as a particularly important part of the gathering. Participants spent about half of the FutureBaptists event in small groups to dialogue about key issues the NABF should focus on for the next few years. Lawton found the similarities that emerged as the groups presented their ideas to be particularly exciting.